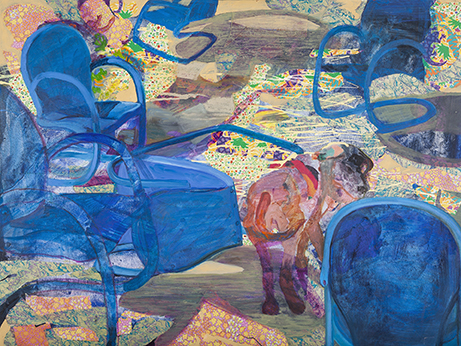 A solo exhibition featuring Karen Hampton, MSU Artist-in-Residence: Critical Race Studies. Join us Friday, January 19, 2018 from 5-7PM for the opening reception for WATER Puerto Rico……Flint a Human Right a solo exhibition featuring the work of Karen Hampton at the MSU Union Art Gallery. Opening Remarks will be offered at 6:15PM. I am a conceptual mixed media artist, addressing issues of colorism and race in my works. I seek to break stereotypes and address issues related to my life. My artwork is steeped in oral history and expresses the narrative of those whose stories have not yet been fully told. As a storyteller, I impart conceptualized stories about the “other” in society. I view myself as a vehicle for ancestral stories to transcend history and remain part of the historical record. The canvas of my artwork is fabric, which I age and imbue with conceptualized images of a forgotten part of the American story. Using images and text, I embed the cloth with the hopes and visions of my ancestors, particularly those whose stories that have remained invisible. 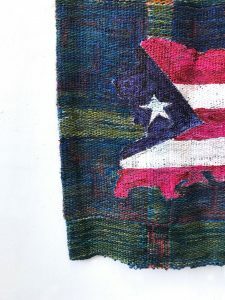 Whether woven or stitched, every time my weft crosses the warp or my needle pierces the cloth, I reach through another layer of scorched earth that slavery has left behind and work to reframe critical issues of race. Karen Hampton is a Michigan State University, Artist-in-Residence: Critical Race Studies. Hampton joins us from Los Angeles, CA for the 2017-2018 academic year. 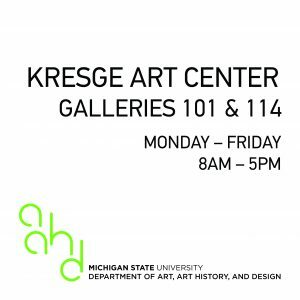 Her exhibition is sponsored by the Department of Art, Art History, and Design along with the generous support of others including the College of Arts & Letters, Creating Excellence Funding Program from the Office for Inclusion & Intercultural Initiatives, Office of the Provost, and the MSU Federal Credit Union. Additionally she will be offering a public lecture about her work on January 30 at 6PM in 107 S. Kedzie Hall. 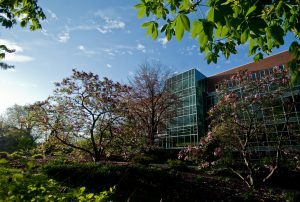 Join us for the kickoff of the MSU Big Read 2018! A screening of the short film What Happens to a Dream Deferred will be accompanied by a panel discussion with Veronica Thronson, José Badillo-Carlos, and Osvaldo Sandoval. 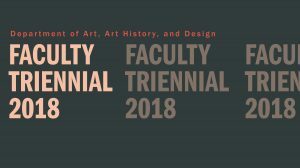 The 2018 Department of Art, Art History, and Design Faculty Triennial Exhibition showcases the recent work of twenty studio art & design faculty members. 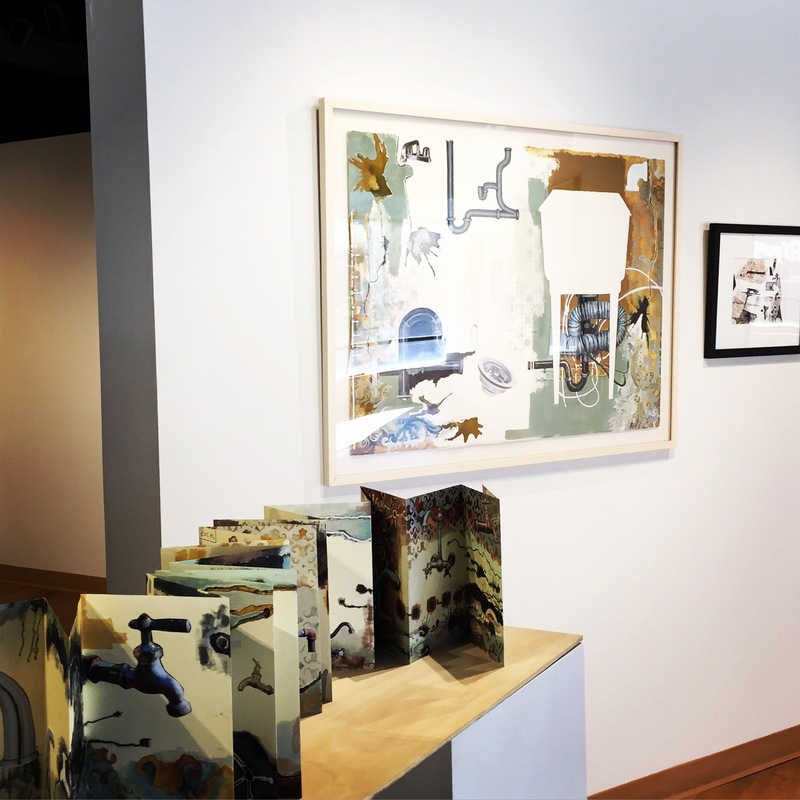 Recognized nationally and internationally, Michigan State University studio art & design faculty member’s creative research is regularly exhibited in venues all over the world. Collectively they have received recognition and support from Fulbright, the National Endowment for the Arts, and the Pollack-Krasner Foundation. 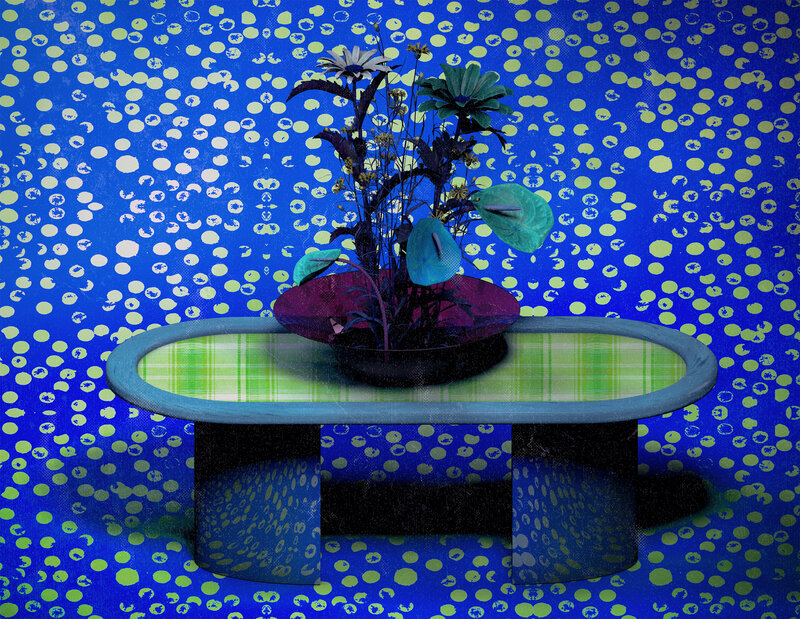 Representing a broad-range of media and contemporary art and design approaches, the exhibition highlights the faculty’s dedication to actively pursuing creative research. The 2018 MSU Department of Art, Art History, and Design Faculty Triennial exhibition is organized by the Eli and Edythe Broad Art Museum at MSU and guest curated by Christopher Atkins, Curator of Exhibitions & Public Programs at the Minnesota Museum of American Art. Support for this exhibition is provided by the John and Susan Berding Family Endowment. A screening of The Magnificent Seven (1960) will be happening at the Downtown Lansing branch of the Capital Area District Libraries on March 20th. Film Summary: A Mexican village is at the mercy of Calvera, the leader of a band of outlaws. The townspeople, too afraid to fight for themselves, hire seven American gunslingers to free them from the bandits’ raids. The professional gunmen train the villagers to defend themselves, then plan a trap for the evil Calvera. A screening of The Magnificent Seven (2016) will be happening at the Downtown Lansing branch of the Capital Area District Libraries on March 28th. Film Summary: Looking to mine for gold, greedy industrialist Bartholomew Bogue seizes control of the Old West town of Rose Creek. With their lives in jeopardy, Emma Cullen and other desperate residents turn to bounty hunter Sam Chisolm (Denzel Washington) for help. Chisolm recruits an eclectic group of gunslingers to take on Bogue and his ruthless henchmen. With a deadly showdown on the horizon, the seven mercenaries soon find themselves fighting for more than just money once the bullets start to fly. 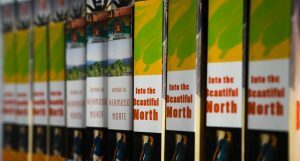 Join us for an evening with Luís Alberto Urrea, author of Into the Beautiful North. 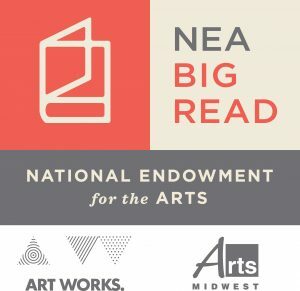 The book is the feature of the MSU Big Read program, funded by the NEA. There will be a public reading of the book by the author followed by a Q&A session. A national juried exhibition of drawning and printmaking and everything inbetween. This exhibition is the result of a national call and features works on paper that explore the ways in which the diverse and inclusive mediums of drawing and printmaking converge and are completely separate. The path followed by a brayer can begin with a pencil, a mouse, a cut, or a maybe a stencil. There is no limit to the ideas that can be explored through drawing or printmaking. The presence of the artist in these processes can be at the forefront or separated by many layers of information. Surfaces can be additive or subtractive. Lines and forms can be ink, paint, graphite, thread, a cut or a tear. The work in this exhibition meets with the act of one material being pulled across the surface of another. Featuring Dianne Wolter’s paintings and sculptures. Painting provides me a process driven opportunity to experiment, discover, manipulate, play, and sometimes even tell a story. I value mark making and like to see evidence of the history of the process in the finished painting. Narrative has been a component of my art that allows me to ask questions and make observations. I use whimsy as a means to enliven or to soften the content. Recurring themes and images return to new environments. Images that possess a personal iconography are infused with content from experiences and memories that hold power. I begin by creating an active ground plane, and then working out to the surface, sometimes finding rather than imposing imagery. I enjoy working figuratively, layering, searching for ideas and inspiration from the manipulation of the media, and often but not always embracing a narrative. Adding papier-mâché sculpture to my studio involvement has been a logical and natural extension to my previous singular focus of two-dimensional work. The process is reductive, starting with foam forms that have been created by gluing construction foam into blocks that can be carved. Papier-mâché mulch and layers of paper finish off the surfaces and ease transitions and contours. The torn paper can communicate a new narrative while holding onto its past. I find myself stacking forms which is another way of layering, bringing elements together in proximity or support, contrasting familiar with fantastic. Dianne Wolter graduated from Michigan State University in 1965 with a Bachelor of Fine Arts degree and a teaching certificate. Teaching and studio involvement have been the focus of her professional life since then. She concentrated on fabric collage for the first 14 years of her creative journey, teaching it in public schools throughout southern Michigan sponsored by the Michigan Council for the Arts. In 1979, Wolter began teaching after school art classes in her home studio to area children. Sharing her studio with children was a rewarding and meaningful opportunity. To concentrate more fully on her own art, she retired from teaching in 2002 to focus more on painting. A whim to make a cat riding on a unicycle introduced sculpture as an additional interest. Since then, Wolter has been enjoying both sculpture and painting. Please stop into (SCENE) Metrospace to see our latest exhibition traveling to us from Bloomington, Indiana where it was recently on view at I Fell Gallery. COMMAND + N was co-curated by Anna Buckner and Sul-Jee Scully of Command Zine and Bill Bass and Raphael Cornford of Noise Project. This special exhibition brings together the work of nine artists; Roxana Azar, Israel Campos, Zachary Carlisle Davidson, Jonathan McFadden, Rowland Ricketts, Saman Sajasi, Caleb Weintraub, Tyler Wilkinson, and Chad Wys. I can’t follow everything going on. You can’t either. I can grab a few strands here and there, focusing my reading and my podcast listening and my conversations. Still, I’m falling woefully short. I know that any sources I access have bias, that I’ve been lied to by dominant narratives across media forms, that my experiences have been misrepresented if represented at all. NOISE and COMMAND Zine co-curate the exhibition “COMMAND + N,” a traveling group show of artists whosework is invaluable, transformative and alive, acting upon us just as much as we respond in turn. Working across multiple media these artists reveal untold stories, recontexualize traditions, speak from marginalized identities, and play with the boundaries between digital and tangible. Bringing together an expertise that spans the contemporary fields of painting, textile, printmaking, photography, comics and digital art, the curators present two exhibitions at I Fell in Bloomington, IN and (SCENE) Metrospace in East Lansing, MI, highlighting selected works as simultaneously discrete narrative objects and cohesively indicative of the story of our time.